Writer Jody Houser continues her incredible work in making these dual-and-dueling Age of Republic issues rhyme with each other. The December releases focused on the public misconceptions of Jedi as warriors, using Qui-Gon and Maul to provide counterpoints on the topic. When the Obi-Wan issue was released, January’s focus was clear. Like Ryan at Mynock Manor I had anticipated the common theme between Obi-Wan Kenobi and Jango Fett’s Age of Republic issues to be fatherhood. As someone who delights in familial themes in fiction, I was ready to tackle this head-on! Unfortunately, despite my enthusiasm and the excellent work by Houser and her teams, I was hamstrung in my analysis. I found myself unable to go as deep into the characters as I had with Qui-Gon and Maul. Understand, I am about the farthest thing from a father as one can get: a childless woman. Now that doesn’t mean I can’t have an opinion about fathers and fatherhood, but Obi-Wan’s (“Mission”) and Jango’s (“Training”) comics were focused very much on these men’s internal lives as fathers. That’s an area I am unfamiliar with, and I could not do these issues justice on my own. Fortunately, I happen to know some fathers. My own dad and one of my brothers were able to take the time to chime in with their own experiences. Abigail: One of the differences that stood out to me between Obi-Wan and Jango’s comics was that one was more focused on building the inner relationship between Obi-Wan and Anakin, whereas the other was more focused on the external lessons that Jango passes on to Boba. My dad and my brother’s reflections acknowledge those differences. For Jango, my brother takes a look into how nature and nurture factored into Jango’s decisions as a father, while my dad tackles one of youth’s eternal questions. Brother: My wife and I are wrapping up the fourteen-month-long adoption process of our first child. To be an adoptive parent one is required (thankfully) to go through hours of adoptive parent training and book reading. What is gained is helpful insight into early childhood development and learning. What was brought to mind when I was reading this issue of “Jango Fett” is the concept taught to us of “Nature vs. Nurture”. This concept addresses how we become who we are. There are many traits of an individual that are passed down genetically that shape a bit of who we are. These comprise the “Nature” aspect. The “Nurture” aspect covers other influencing forces that shape who we are. Such things include the kind of environment we grew up in or the people or circumstances that influenced us in our formative years. Returning to the story in “Jango Fett”, Tyranus did not recruit Jango for his nurtured aspects but for his clone-able nature. Only the natural and genetic traits could be duplicated in the labs on Kamino. For young Boba Fett in this story, we see Jango’s intent for his nurture. The traits and skills Jango possesses come from his own upbringing, which may be complemented or enhanced by his natural talents. This upbringing, or nurturing, if you will, is described in the intro as a “past…built on violence and destruction.” This is the life Jango has learned to survive in, and he intends to pass this same legacy on to Boba. In adoption training we hear about children from neglected or abused backgrounds and how such broken attachment experiences influence them as adults. Their experience could have taught them that they cannot rely on others. Working as part of a team or company as an adult will be a struggle as these require relational skills developed through years of healthy interpersonal interactions; “people skills” if you will. When early traumatic experiences shatter the basic trust in such relationships, the individual will regress into their natural survival instincts of fight/flight/freeze. They will grow up with an elevated stress level, always monitoring their surroundings for threats. Higher functions of the brain needed for interpersonal development will be hampered and their relationships will be affected. If a child were never to be removed from an environment filled with threats I can imagine survival skills will be honed to a great degree. Such survival instinct may be a necessity to survive in such a dangerous line of work as bounty hunting. It is not an existence I would relish having, no matter the legacy. Dad: “Can I drive?” is the hope of most young, inexperienced children. It is the moment of discovery and a desire to have responsibility at some level. The older, more experienced adult will know when the time is right for the child to earn their wings in that area. In other areas in life, it is good for the adult to let the child work on problem-solving for themselves, within reason and safety. By this they will learn from both mistakes and positive outcomes, until lessons become intuitive. I think it is good to have a bring-your-child-to-work day. I only did this once, when I was a self-employed carpenter, it was wonderful the excitement in my child’s face. As a father, I regret that I did not continue this as a tradition with my other children as I moved on in my career. Looking back, “career” should have taken a back seat to the experiences that would have afforded something priceless for my children. Something to help give them the bigger picture on life, to help expand their horizons beyond their current norm. Abigail: That love my dad mentions is what drives the relationship – and the friction – between Obi-Wan and Anakin. What’s ultimately missing in Obi-Wan and Anakin’s relationship until this point in Age of Republic is the clear expression of love. My dad looks into how assumptions are made by both parties, and my brother reflects on how the love of a father must include expressed belief in the child. Dad: Simply because someone is young and inexperienced (Padawan/child), and hasn’t experienced all that you yourself (Master/father) have gone through in life, doesn’t always mean that there is not a desire for more understanding. Or for having their heart heard. Or for a little more responsibility. If you have a pre-formed perception that a child may not want those things or that those things aren’t an important sentiment to them, that may cause a blindness, of sorts, within yourself to what may be stirring on their insides. Once a child feels that they have been heard and that what they have to say is important, that is significant. There can come an inner excitement, eagerness, and anticipation when a child feels that they matter. And we ourselves, the more experienced adult, are not without the need to learn from the insights of those who once learned from us. This can create a great source of pride for us in them and in what they do and believe. Love drives all. Brother: “But his Master’s belief in him, he also needs.” Yoda’s quote was the first thing that caught my attention when reading this issue of “Obi-Wan Kenobi”. How Anakin’s and Obi-Wan’s relationship is portrayed in this issue brought to mind my own upcoming adoption of our first child. Anakin’s upbringing in the Jedi Order was not like most other Padawans. Other Padawans had been raised by the same “parents” for as long as they could remember. Anakin had another life beforehand, one that Obi-Wan had never experienced; “You were never a slave or anything else like that”. My prospective son will be nearly six years old when we first meet him. After his birth and foster parents, we will be his third set of parents. I, myself, grew up as a “normal” Padawan with my own birth parents. As such, there will be many things that I will not understand about his experience as an orphan. 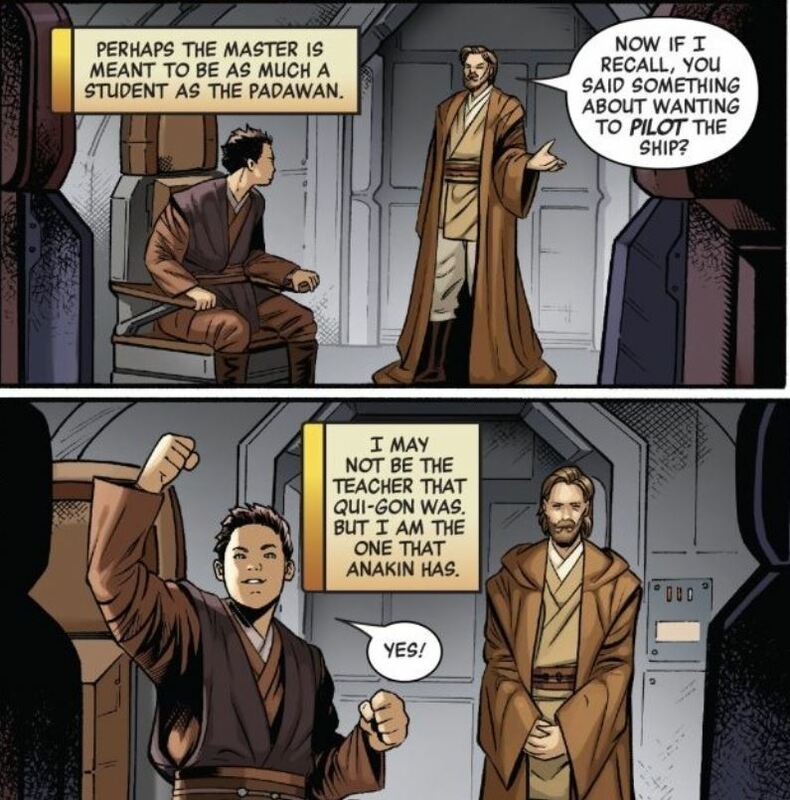 I will still be in the role of his “Jedi Master” but I can imagine there will be a level of disconnect as seen in this issue between Obi-Wan and Anakin. My son’s circumstances have definitely created challenges in his life. Our adoption parent training has extensively covered this fact and our parenting expectations have been adjusted accordingly. Yet, Yoda’s words cause me to pause and realize I cannot lose sight of my son’s potential. If I only view him in light of his physical limitations, my over-protectiveness could rob him of opportunities to use his God-given gifts. But what if I let him try and he fails? In Episode VIII: The Last Jedi Yoda reminds us that “The greatest teacher, failure is.” When my son is presented with challenges or opportunities, I want to be his biggest encouragement, regardless of his success or failure. This resonates with me because such affirmation had once been my own greatest need. Receiving it gave me the critical confidence I needed to grow. Abigail: Jody Houser and her team continue to knock things out of the park with Age of Republic. Not only have these been character explorations, but they’ve also invited us to think about larger concepts. In December, Qui-Gon and Maul gave us an opportunity to reflect on a grand part of the Star Wars universe. In contrast, Houser’s January releases brought things much closer to home with the theme of fatherhood. With insight from my dad and brother on these comics – much thanks to them both! – I had an opportunity to see through the eyes of a parent in a new way. I can’t wait to see what Houser encourages us to explore next.